Saint John Bosco was born in Piedmont, Italy in the year 1815. He was raised in a Roman Catholic Christian family but was too young ever to know his father who died when John was only two years old. John's mother raised four children and taught them the importance of their faith. At the age of four, John began to do small jobs to earn money to support the household. As a child, John's favorite pastime was going to fairs and carnivals and watching the jugglers, tumblers and magicians. When he returned home, he practiced their tricks until he had mastered them, and then he would go on to the street and perform asking only prayers as his only payment. From his childhood, St. John Bosco had a great desire to become a priest and help young boys who like himself were not able to afford all the pleasures in life. He worked hard so he could afford to leave his family and attend school. Eventually John entered the seminary. He excelled in his studies and served as a model to other seminarians on how to live a holy life of happiness. At the age of 26, John was ordained to the priesthood and set out to take his message to the world. He is now called Don (Father) Bosco. Above all, he created a family atmosphere of trust and caring. Those who helped him were amazed at the transformation in several youngsters. 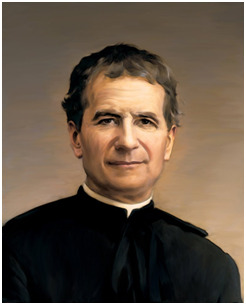 Don Bosco died at dawn on January 31, 1888 after spending his whole life working for youth. While on his deathbed, he whispered to his Salesians: "Love each other as brothers. Do good to all and avoid evil... tell my boys that I am waiting for them in paradise." The greatest gift that Don Bosco has left posterity is his unique way of educating, a method that was inspired by his one magnificent obsession: "It is enough to know that you are young and abandoned for me to love you very much." The “Salesians of Don Bosco” is an international society where priests, brothers and sisters wholeheartedly execute the vision of Don Bosco and work for the development and education of the young especially those most at risk. Through its 3000 Schools, Colleges, Technical schools and youth centers in 125 countries, the Salesians of Don Bosco serve all young people irrespective of religious differences or social inequalities. In India, Don Bosco Educational institutions are spread all over the country and are in great demand. The style of education consists in involving young people, their parents or guardians and the educators in a family atmosphere. The method adopted is one that was lived and handed down by Don Bosco himself: “The Preventive System” based on Reason, Faith in God and Loving Kindness. The object is Integral Education. This embraces developing physical and aesthetic talents, training in occupational skills, fostering intellectual skills and competence furthering cultural development and integration with others including moral uprightness.